You’re Not in Kansas Anymore | ¡VidaMaz! We picked Danny up from Boy Scout camp on Saturday, June 14, 2008, my friend Basma’s wedding anniversary, to begin our big adventure. Before leaving Leawood we had to stop one last time to say goodbye to our dog, Nacho, who now lives with good friends on their acreage. The day before we departed had been the 35th anniversary of my first airplane ride. This time we were driving: a Honda Civic hybrid, loaded to the gills with three people, four computers, and loads of other have-to-have-right-away goodies. Needless to say, we wwaaayyyyyy exceeded the weight limit of the vehicle and the car barely cleared the ground. We drove diagonally through Kansas—truly a beautiful state. We knew we’d miss the prairie, the Flint Hills. We were psyched to be able to drive through Greensburg, the town so devastated by the tornado and now rebuilding itself as a world-leading green city. What an encouraging way to leave the US. 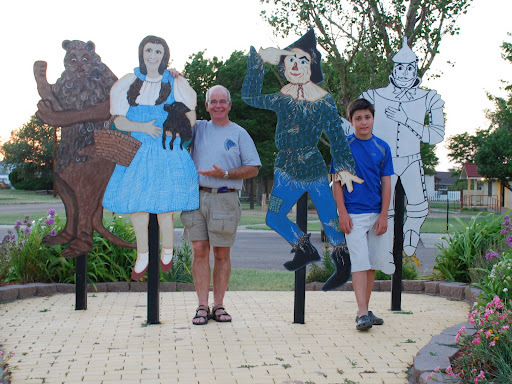 We spent our first night in Liberal, Kansas, two blocks from Dorothy’s house in the Wizard of Oz; quite fitting, we felt. The journey went really quickly and smoothly. Good highways the whole way, we met all terrific people, and it was fun counting the states. We crossed the border in Nogales, where we had our foreign resident cards stamped, and 50km or so later registered our car. Hooray!!! ¡Bienvenidos! Crossing over the thousands of topes (speed bumps) on the journey through Mexico was not easy given our heavy load, and we had to stop at a mechanic’s once to have something underneath the car tied back up. The only really hairy episode was at one point on the highway in Sonora. Greg was driving, and heading towards us on two wheels, out of control and loaded to three times the height of the cab, comes a pickup truck. Greg froze: heading to the right would take us off the road and into a deep ditch, no doubt flipping us; heading left would take us into the path of the pickup if he was able to right the truck and course-correct; staying where we were seemed to be suicide. Fortunately, the driver was able to get back on all four wheels and onto his own side of the road, and all was well. We spent our third night, the only night on the road in Mexico, in a “Romance Hotel.” Pulling in it looked great: advertising air conditioning, cable television, room service. It looked clean and new and very private; like a Japanese “love hotel,” you drive straight into a garage with your car, close the door, and no one sees who you are; great for secret trysts. Once we were in the room, we realized the AC didn’t work and the window didn’t open; we were stuck in a steam bath! We ordered dinner delivered, but when they brought it, they couldn’t get the garage door (only door to the outside) to open; the switch had come loose and fallen inside the cement block wall. No worries. We survived, spent one of the most steamy, sweaty nights of our lives, but the next day we made it to our new home and all was well. Seeing that ocean in front of us made everything good! just discovered your blog and went back to the first few entries. you mentioned japan and italy, both countries in which i have lived. are you perhaps former military? my huband used to be in the navy and we did 2 tours in japan and one in sicily. this fall i was fortunate enough to take a tour through italy and france, and the highlight of my trip was hiking the towns of cinque terre.have a great week and enjoy carnaval. hope to someday be in mexico during that time.teresa in lake stevens, wa.p.s. i must admit that you're the first person i've ever heard describing kansas as a beautiful state. i've only driven through it on I-70 so really can't comment. No military brat. I lived in Japan a long time–Kyoto, Hamamatsu, Tokyo. Never in Italy, though I've traveled there on holiday many times and love it. Cinque Terre is one of our favorites. Had a good friend get married in Portovenere, and we stayed on an extra ten days or so…We are definitely looking forward to Carnaval. You have a home down in Mazatlán? We live here year-round, but have a condo in Waterford, WI, between Racine and Kenosha.Kansas is definitely beautiful–wind, sunrise and sunset over the rolling prairie and grasses. KC's Plaza is designed to look like Sevilla, Spain–marble fountains, handpainted tile work, cupolas…..Thanks for visiting our blog!